Anna Sui Rock Me fragrance that would let every girl be her own rock star. Anna Sui Rock Me 30ml. EDT - Rock and roll is so much a part of my life that I wanted to capture its energy, independence, and playfulness in a fragrance that would let every girl be her own rock star. Rock Me is a fruity-floral combination of notes which is filled with liveliness and attraction. Top notes incorporate William pear, green orange and peach skin, which add aromas of a heart – honeysuckle, jasmine and lotus. A base encompasses cedar, amber and vanilla. Starting from fruity and flirty opening, over gentle song in the heart, the fragrance finishes with warm and dynamic accords. 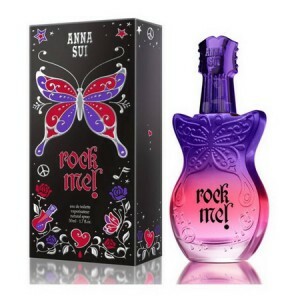 Anna Sui Rock Me is available in guitar-shaped bottle, iridescent in pink, purple and violet nuances. Its outer carton is coloured in black, decorated with a butterfly and hippie motifs of flowers and stars. Anna Sui Rock Me is advertised by popular Agyness Deyn. Rock Me! was launched in 2009.